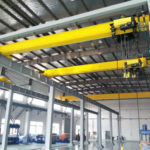 Suspension crane is a kind of small and lightweight overhead crane, also known as under running crane or underhung crane. It is widely applied in workshop of production and assembly lines, warehouse and other places to lift and move heavy loads. 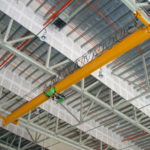 The underhung crane, as its name implies, is suspended from building roof structure and runs at the bottom flange of runway beam. Single girder suspension crane is designed and manufactured in strict accordance with industrial standard JB2603-94, usually equipped with CD and MD electric hoists. 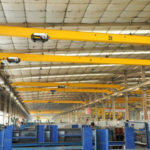 Due to its distinct structure, the under running overhead crane usually comes in single girder design, thus it cannot lift a considerable amount of weight. The capacity ranges from 0.5 ton to 10 ton, the span of is 3-22.5m, working classification is A3-A4. It is a perfect solution for facilities where the building height is an issue or there are no supporting columns. 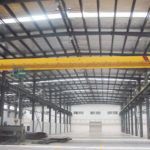 The construction of underhung crane does not require any building column or engineered column. It has compact structure and strong rigidity. 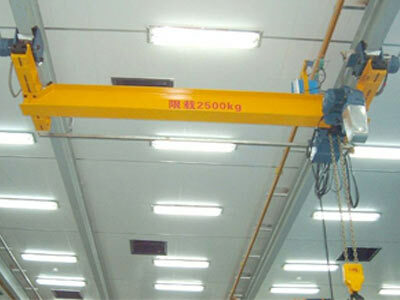 The crane hanging from building ceiling helps increase lifting height within the limited building space. 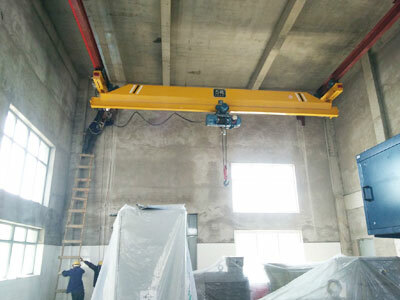 The underhung crane will make the most of building space as it can maximally approach the building wall. It generates low noise and little pollution during lifting operations. It has less tracking problems than a top running overhead crane. Multiple bridges on the runway beam. When your facility structure is not strong enough to support a top running bridge crane, a suspension bridge crane is a good option. 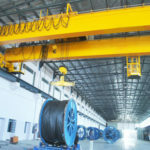 You may choose two suspension cranes instead of a top running overhead crane to lift the same amount of weight if the building support is insufficient. Electric hoists. 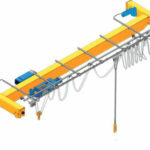 In addition to CD and MD wire rope hoist, electric chain hoist is available for you to choose from. Bridge buffers. 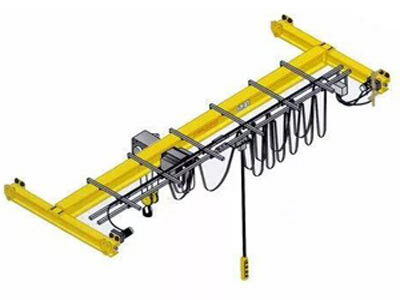 In the event of two or more bridges mounted on the same runway beam, the buffer is applied to restrict the travelling distance between these cranes to avoid excessive load to the runway. Runway end stops. It can be installed to meet your safety demand. Other options include festoon cable, bridge and runway structure design. 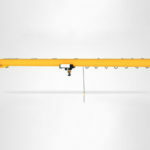 The suspension crane is specifically designed for facilities where the height is insufficient to support a top running overhead crane. Of course there are some limitations of underslung crane. On one hand, the hook height will be reduced for that it travels at the bottom of runway beam. On the other hand, it applies greater load to building roof than that of top running crane. 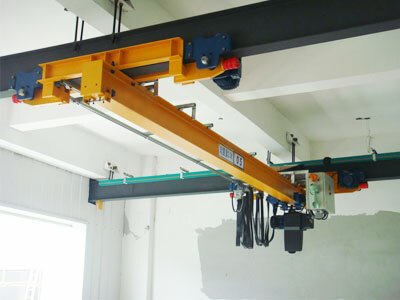 In addition, in contrast to a top running system, the suspension crane is not that much easier to maintain. 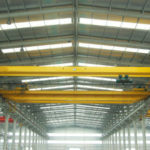 Considering the advantages and limitations of underhung system, you may opt for this form of crane depending on the ceiling height of your facility and specific lifting requirement such as lifting height and capacity. To serve your special lifting needs, Dafang will provide custom design. Contact us online now for further information.